Palm Sunday commemorations highlight ways of peace and reconciliation in contrast to dominating powers of coercion and control. It will be a crazy mix, just as the Jerusalem crowds were. There will be contemplative Christians, singing Christians, shouting socialists, bemused bystanders, and those simply seeking to stand alongside destitute men, women and children who have been demonised and incarcerated indefinitely by our authorities for daring to claim asylum in unapproved circumstances. Together we will be claiming the radical hope that love and justice will prevail. There have been enough Good Fridays. Let Easter Sunday prevail! New asylum seeker campaign ‘distasteful’ and ’embarrassing’. 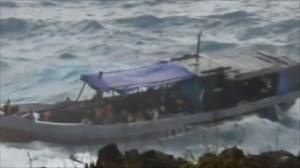 Just when you think the Australian Government can do no worse in its cruel and dispiriting treatment of maritime asylum seekers, it pulls another rabbit out of the hat. This so-called low key cartoon strip campaign does little more than throw down a challenge to those desperate to flee to safety. Rather than threaten with blockades that grumble “no way” all sides of our parliament should be seeking ways to enable a safe way for people to seek asylum in this whole region. This will demand imagination, leadership – and, most importantly, will – for many years of political and media propaganda have manipulated the public’s mindset to fearful and selfish preoccupation. … from trying to keep up with Australia’s “Stopping the Boats” campaign! Welcome to Australia – unity and diversity « Call to radical discipleship. The melancholy cloud that began my week re Australia’s asylum seeker treatment got a hint of a silver lining this morning when the above post from my nephew, Mark, lit up my screen. It showed what is still possible when we operate on the principles of hospitality, generosity and care rather than fear and hostility. It reminded me of the earlier Community Refugee Resettlement programs that took place right in our midst. Mark’s post was also a reminder of current conversations around “receptive ecumenism” which looks to gain wisdom and understanding from careful listening to the other rather than being burdened with what we can impart, and the new ecumenical challenge which is no longer cross-denominational but cross-cultural. Maybe the glass is half-full again! I’ve just been listening to politicians conscientiously “questioning” the rationale for flying bereaved asylum seeker detainees the long distance from Christmas Island to relatives’ funerals in Sydney. These are the victims of the shipwreck off Christmas Island late last year. “Why not lay them to rest on Christmas Island?” they opine. Forget the fact that there is already extended family in Sydney where the traumatised refugees hope to relocate and would surmisably gain some degree of comfort that their loved ones were laid to rest nearby. What’s the cost of a plane fare compared to the extraordinarily extravagant cost of off-shore detention? I want to know why both Government and Opposition persist in singing the praises of off-shore detention when mainland community based assessment and resettlement was healthier, more integrative and humane for so many years.